Bought this for my wife because she loves green. She loved it and wears it almost every day. Nice watch and was a great value on Overstock. Will definitely be buying more watches from them! strikingly good looking on my wrist. 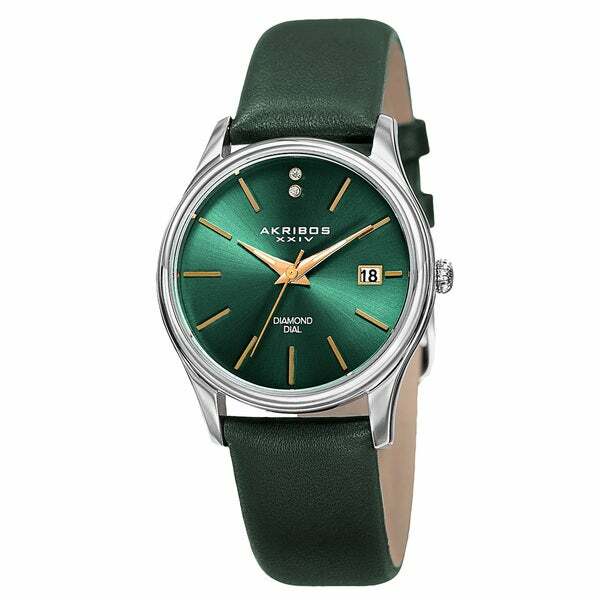 The watch hands show up well against the emerald green face & the green leather band is supple & comfortable. Very pretty watch but I needed a powerful lit magnifying glass to find what passes as a diamond. Also, bad directions on setting the date. Tried for a week, finally found a friend that knew how to do it. Beautiful watch. Love the green face and leather band. Very unique. Very pleased with the easy to see dial. The color is beautiful and the wristband fits well. It has a very classy appearance. This was a good choice. I bought this watch for my daughter who loves the color green and she was very surprised to receive it! She loved the color and said the only issue was that the band was a little large and could have used more holes as she plans on bringing it to a jeweler to make the adjustments. Bought this as a gift for my sister who loves the color green. Hard to find such a rich, deep green to suit her tastes, but you had it! She loved it and now wants me to do all her shopping! I just got the watch today wore it all day. So comfortable. Quality is great. Color is fantasic. Style is so smart looking but totally a watch for all ladies. I was leery of buying this watch because I was afraid it would be overwhelming. Well it's not, it's gorgeous! I LOVE the deep green color. It's not too big and the price was really good on it. It's well made and I can't wait to wear it. Beautiful watch by Akrbos, looks more expensive than what I paid. Watch stopped working a month after I got it. Replaced the batteries and still didnt work. Everything they said it was.